Serene And Softening Skin Treatments With Decorus Aesthetics! I had the chance to try out some complimentary medical skin treatments recently in exchange for this review. Before getting into it, I just want to say that it’s in no way as intimidating as it sounds. I find applying the word “medical” to things like this can sometimes scare people off. Personally I think most of the time, medical actually just reaffirms that the treatment is going to be effective. As I’ve been struggling massively with blemishes and scarring around my jaw especially, I thought this opportunity was absolutely perfect for me and for any readers that have been following my journey with my skin with the same issues. Decorus Aesthetics is a home grown business run by the lovely Kia Payne. Kia is a qualified nurse alongside having her business venture, assuring she is highly experienced and knowledgeable in all areas surrounding the treatments she offers. With over 10 years of experience in dermatology and aesthetics, she offers a wide range of treatments and services including but not limited to botox, eye lash extensions, chemical skin peels and is constantly expanding them, too! My first experience of Kia was over email where I expressed my concerns with my skin and she put together a set of treatments suitable for me with ease. I arrived on the day excited for what was to come but didn’t realise just how helpful it’d be. Kia was extremely friendly and made me feel comfortable as soon as I stepped into her home. 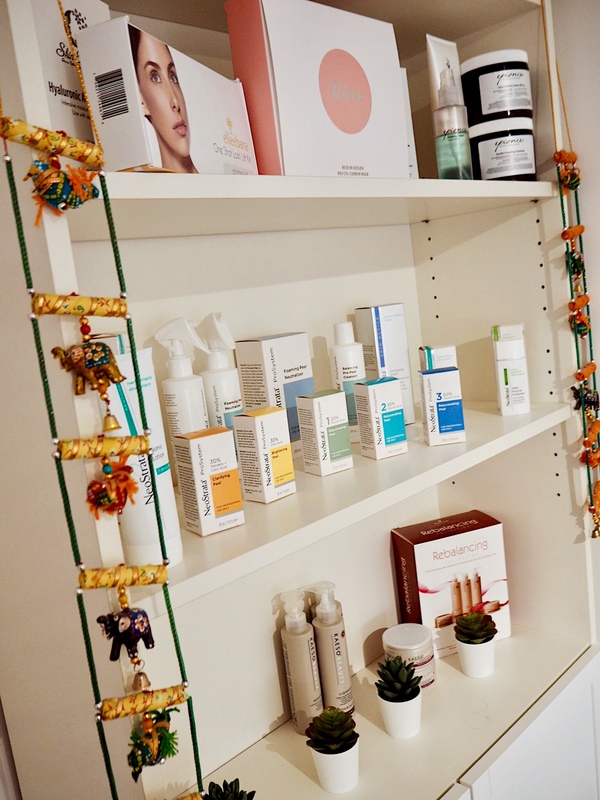 Before the treatments could start, we had a quick chat about my skin and her business whilst I filled in a consultation form. Kia also told me she had read up on my blog and health condition and was going to work some reflexology into the routine to help with my physical pain. This was honestly one of the nicest and most unexpected wonderful things I could’ve asked for! I suffer a lot with ongoing pain and to hear someone was going out of their way to try and help me was really incredible. Major points for personalisation and client care! So onto the treatments I had and my experience of them. Medical microdermabrasion is actually a treatment suitable for everyone and anyone. It’s most commonly used on the face but can also be used on the chest, back and shoulders! It’s a painless procedure that resurfaces the skin by using fine, medical grade crystals to buff away the top layer of dead skin. By doing this, it showcases the beautiful, fresh and smooth layer of skin underneath revealing a wonderful, glowing complexion! It’s used to treat things like sun damage, hyperpigmentation, age spots, black and white heads aswell as my reason of acne and blemish-prone skin. The average microdermabrasion session lasts around the 30 minute mark depending upon the desired outcome of the treatment and the size/area of the skin condition. It’s not uncommon to notice immediate improvement after the first session which really proves that the long-term benefits can be incredible. It’s a modern, safe and virtually painless alternative to laser and chemical peel treatments and has now been used to treat millions of people. There’s minimal risk, no anaesthesia involved, no recovery time afterwards and no hazardous chemicals used. I was a little nervous about this as I had no idea what it was going to feel like. Before putting it on the face, Kia tested it on a part of my arm just so I wouldn’t be shocked. It didn’t actually hurt at all! It kind of just felt like large, gritty particles of salt were being rolled onto my skin. It certainly wasn’t unpleasant, just odd! 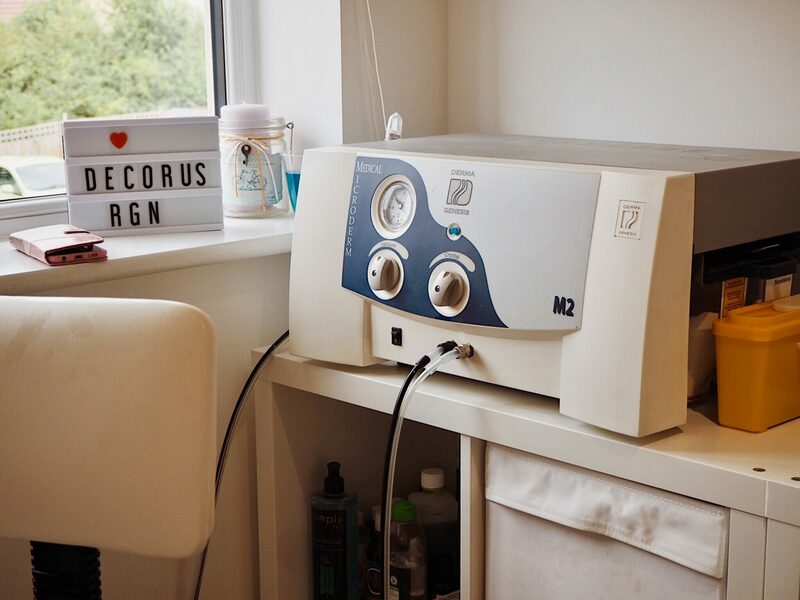 After around 15-20 minutes of treatment using this machine, it leaves a thin layer of crystals behind on your skin so it’s important to cleanse them off. Despite the machine making quite a bit of noise, i actually found it quite therapeutic and loved the idea that my skin was being resurfaced there and then. This is quite a new treatment in the beauty world and I am so excited to have been able to try it! It uses the natural healing power of light and activates the skins photoreceptors to allow the skin cells to absorb its energy. The LED penetrates the skin so essentially treats any conditions from the inside out. It helps to banish the creation of bacteria, reduces inflammation and even stimulates the production of collagen! It is said that there is no skin care on earth that can penetrate as deeply as LED treatment and being a non-invasive procedure with no down-time or known side-effects, makes it even more convenient. The LED mask device Kia uses is by the company Neo-Elegance. They’re known to be widely used by doctors as well as dermatologists across the UK aswell as celebrities investing in them for integrating into their skincare routines. It’s a beauty industry recognised device, being noticed and praised by the likes of Glamour magazine, OK! and even the Daily Mail! There are three different colours of light that the mask can switch between with different benefits such as reducing active acne, preventing breakouts, revealing smoother, firmer and plumper skin and accelerating cellular renewal. I’m not going to lie, this wouldn’t be the best treatment for someone who gets claustrophobic as the mask covers the entire face and part of the neck. You can very easily breathe in there though and after a few minutes of settling into the routine, the changing of colours gets quite relaxing. The mask isn’t heavy or uncomfortable and Kia applies cotton pads onto the eyes before putting it on, just for that extra bit of protection and comfort. All you simply have to do is lie back with the mask on, relax and let Kia give you a soothing hand and arm massage to enhance the experience. I found it hard not to doze off! After trying out two new things, it was lovely to end the experience with a good old relaxing facial. This included some gorgeous Neostrata and Exuviance products such as a clarifying cleanser and a bionic oxygen mask which I luckily received some miniatures of to use at home. The cleanser has especially been a favourite due to the gorgeous fruity smell and how extremely soft it makes my skin feel afterwards! I was quite overwhelmed in the best way to what was included in this “facial”. As I mentioned before, Kia said she was going to work some reflexology into the regime. Aswell as a wonderful facial massage working on different pressure points, there were other techniques from all sorts of different backgrounds including Indian head massage and lymphatic drainage around the neck area. She also worked right down to stretching the legs out to incorporate the whole body into the relaxing experience. It was very hard for me not to fall asleep, especially with the relaxing spa music on and after the hand and arm massage beforehand! We ended with the enzyme peel to put the icing on an already wonderful cake! This was the “NuPeel Natural Enzyme Peel” and it helps to accelerate the turnover of skin cells aswell as stimulating exfoliation of the dead ones. It relies on natural enzymes rather than abrasives to gently remove dead skin cells and leave behind a more even skin tone and a beautiful base for your make-up. It can also be used for problem areas on the elbows, feet and legs! I thought I’d take some progress photographs of the difference in my skin to see what you all think! Skin is quite bumpy, red and angry with a lot of blemishes. (Please excuse the colour of my skin, my painkillers drain me of my colour sometimes, haha. The tattoos on my neck are also transfers so they’re gradually rubbing off!) Skin looks smoother and less angry but is still settling down. Skin looks A LOT smoother and with noticeably less redness. I like to think it looks quite radiant and plump, too? I was extremely confident to leave the house with no makeup. Redness and blemishes have really calmed down. Feeling so much better about the tone and look of my skin! I can honestly say I am so, so pleased with the results from these treatments. I keep feeling my face, especially all around my jaw area as I can’t believe how much smoother it is! I personally feel that the microdermabrasion was probably the most effective in this but all of them together have made my skin look and feel really magical. I haven’t felt this nice about it in the longest time and it’s all thanks to Kia and her expertise! She has for sure gotten herself a new customer in me and I would hand on heart highly recommend Decorus Aesthetics to anyone in the Bristol area looking for skin treatments, anti-wrinkle injections or even just a pamper! Kia offers extremely reasonable prices aswell as some great package deals and discounts if purchased in bulk of 3 sessions. I cannot wait to book back in with Decorus Aesthetics after my surgery! How often do you or would you like to get professional pamper treatments? Budget Makeup Essentials Under £10! The Ordinary: Are My Skincare Struggles Solved? Pink Glitter Cut Crease Makeup Look! "TattooedNow: Pretty and Punky Pretend Tattoos!" "My IBD Story: Goodbye & Good Riddance!" The fact that Kia read your blog behind and added to the routine is one of the sweetest things ever! Companies that make an effort is everything! I know how much you’ve spoken about your skin and blemishes, and I’m glad you have found something that really works! I would love a facial one day! Love finding new skincare brands and treatments. That light therapy looks interesting. I recently tried the Neutrogena portable light therapy and it’s actually pretty good for treating breakouts! Oh my gosh there is such a difference! I’m so impressed! I have never tried a professional pamper treatment but after reading this I definitely plan on getting one, the LED mask looks very interesting! I had never heard of most of those treatments! I’d be curious to try them out! My skin is quite angry at the moment. I am glad it worked out so well for you! You literally read my mind! I saw ‘medical’ and got scared. But these treatments look really interesting, especially the LED one. I don’t think I’ve heard of these before. I’m so glad that you’re happy with the results, having great skin is a massive confidence booster! This brand and the treatments they offer sounds amazing. I suffer from a few breakouts on my chin area and find that the breakouts leave read scars which is so irritating. Might need to do some research into this brand and give them ago. The funny thing about nurses is that they’re just as knowledgeable as a doctor but without the doctorate degree. They’re also more hard working!